This article highlights some of the common genetic variants that may play a role in infertility. It is just a starting point… My hope is that it gives you enough information to get started on figuring out the root cause of your problems conceiving. Everything here is for informational purposes only, based on research studies on genetics and fertility. Please talk with your doctor for medical advice or seek help from a fertility coach or expert. How does the MTHFR variant impact fertility for women? A lot of people think of pregnancy in basic terms: sperm meets egg and 9 months later you have a baby. Birds do it, bees do it. Heck, even trees do it, in their own way. But when you get down to the specific details, it gets a lot more complicated. At puberty, women have around 300,000 to 400,000 follicles in their ovaries. These primordial follicles are tiny fluid-filled sacs that contain the oocyte (immature egg cell). Over the course of a woman’s reproductive years, only 400 – 500 eggs will reach maturity. That egg cell that gets released at ovulation is what can get fertilized by the sperm, resulting in pregnancy if all goes well. The egg needs to be healthy with no DNA damage. For all of this to happen, the reproductive hormones need to be at the right levels and at the right time. Follicle stimulating hormone (FSH) rises at the right time to stimulate the immature follicles to begin to mature. Without FSH, the immature follicles will go through apoptosis (cell death). When the follicle reaches a certain size, it will start secreting estrogen. This causes a surge in gonadotrophin-releasing hormone (GnRH). The surge in GnRH causes a surge in luteinizing hormone (LH) secretion, which triggers ovulation. As women age, they have fewer follicles in their ovaries eventually reaching the end of reproductive span at menopause. A hormone called AMH (anti-mullerian hormone) is often used as a marker of ‘ovarian reserve’, an estimate of available eggs. But the ovaries aren’t like a gumball machine, spitting out good gumballs (eggs) up until the last one comes out. Oxidative damage, insults to the cells, etc. cause egg quality to decline as we age. Conditions that can decrease fertility rates include PCOS (polycystic ovarian syndrome), hypothyroidism, diabetes, and autoimmune diseases. The risk of recurrent miscarriages also increases with age. Blood clots can increase the risk of recurrent miscarriages, and several genetic variants cause increased clotting. The MTHFR gene codes for a key enzyme in the methylation cycle. It is the final step for converting folate into the form the body uses, methylfolate. While most women know that folate is important to a growing baby, the MTHFR gene can also impact other aspects of fertility. Research shows that the MTHFR C677T and A1298C variants impact fertility in a couple of specific ways. There are several genetic variants that increase the risk of blood clots and conditions such as deep vein thrombosis. These genetic variants also increase the risk of recurrent miscarriages due to clotting. This does NOT mean that everyone who carries these variants will have a miscarriage. It is something to talk with your doctor or fertility specialist about. Note that the 23andMe and AncestryDNA raw data is marketed for informational purposes, not clinical testing. So if your raw data shows that you carry one of the risk factors below, you should talk with your doctor and consider possibly getting a second test done for verification before making medical decisions. PCOS is thought to be partially genetic, with about 70% of the disease risk due to genetic factors. There are quite a few genes that contribute to the risk of PCOS. Instead of listing them all here, please read my article on PCOS. Your overall health impacts your ability to reproduce. This makes sense for all animals and especially for humans. How can you increase melatonin? Two free things you can do that will greatly impact melatonin levels: Block blue light at night, get out in the sunshine during the day. Below is one common melatonin receptor variant that increases the risk for PCOS. Read more about other melatonin genetic variants here. Vitamin A can be obtained in the diet in retinol forms from animals sources or in beta-carotene in plants. The beta-carotene form has to be converted by the body into the retinol form — which is where genetics comes into play. Note that while essential in the right amount, too much vitamin A, through drugs like Accutane (isotretinoin, acne medicine) or through really high levels of vitamin A supplements, can cause birth defects. People with a T allele on both rs12934922 and rs7501331 have a 69% decreased conversion of beta-carotene to retinol. In women undergoing IVF, increasing concentrations of BPA in their blood correlates linearly with decreasing number of oocytes and pregnancy. [ref] And yes, nearly everyone has BPA and phthalate metabolites in their body. Some people can detoxify and clear out the BPA and phthalates better than other people. Read more about the genetic variants associated with BPA detoxification. Read more about the genetic variants associated with phthalate detoxification. I’ve thrown a lot of information into this article, but it is just a portion of what goes into the mix for fertility. If you are dealing with infertility, genetic variants are probably playing a role — whether through PCOS, altering your vitamin or hormone levels, or through increasing the risk for problems from toxins. But this is just a part of the picture… stress, sleep, and diet are all important also. Obviously, the first place to go for help when trying to conceive is your OB/GYN for testing. Your OB can do ultrasounds and other tests to rule out a physical cause. Hormone testing is also available to make sure everything is normal there. There are also fertility experts that offer online coaching and help as you go through this process. Julie Chang at Fertility Eggspurt is one that I can recommend if you are looking for information online. Or ask around for recommendations in your local area. Talking with people, getting lots of good information, and getting some emotional support are all helpful when dealing with problems trying to conceive. There is a lot of information available about MTHFR and taking methylfolate instead of folic acid. Here is my take on folic acid along with the research on it. 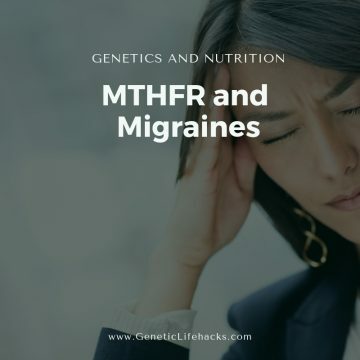 It is vital for women who carry the MTHFR variants to ensure that they meet their body’s needs for the methylation cycle. This can include adding more folate to the diet (liver, green leafy veggies, legumes) or taking a methylfolate supplement. In general, a balanced diet that includes eggs (choline), organ meats (creatine, choline, folate), organic vegetables (folate), and bone broth (glycine) may cover your dietary needs for methylation cycle optimization. If you are on a diet that cuts out any major food groups, you should track your diet for a week or two to make sure you are not missing out on anything. There have been quite a few studies on the effects of eating more fruits and vegetables on IVF outcomes. Other studies, though, in women trying to conceive, do show that increasing fruit consumption decreases the time to conception — and that higher fast food consumption increases the time to conception. But the effect size is fairly small here. The changes were on the scale of 0.3 to 0.9 months difference — so less than a month difference in time to conception.